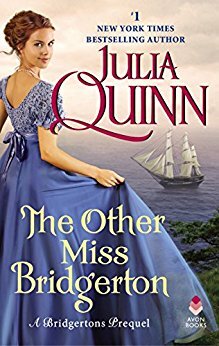 The Other Miss Bridgerton is the third novel in the prequel Bridgerton series by Julia Quinn, this series and this author is always a must buy for me – so I had high expectations for this book, and it did not disappoint. Poppy Bridgerton is the cousin of Billie Bridgerton (from the first novel Because of Miss Bridgerton) and has just finished her second season in London with no suitor success, not that she minds though, Poppy is very strong willed and independent and refuses to marry someone for just their looks or money. She decides to visit her friend on the Dorset coast where she discovers a hidden cave with smuggled goods. While she is exploring the cave, two pirates discover and kidnap her onto their ship. It’s here that Poppy meets Captain Andrew James Rokesby, the captain of the ship delivering goods and British government documents to various ports in Europe. Those who read the previous two novels in this prequel series will remember Andrew as the youngest Rokesby brother and one of Billie’s best friends. Poppy has no idea that Andrew is a Rokesby and therefore a neighbor and brother-in-law to her cousin Billie or that he is actually not a pirate but a government agent. Andrew, however, is well aware that Poppy is a Bridgerton and that he will likely have to marry her if news of her kidnapping comes out. As they sail towards Portugal, what starts off as annoyance at each other soon turns into a game of wits and leads to more serious feelings. This book was packed with goodness from the start right to the end. There was so much depth to all of the characters, and each chapter revealed more and more details about the lives of everyone and how it has made them who they are today. Poppy was stuck in a cabin for the majority of the book, which you would think would be boring for the reader, but her interactions and conversations with Andrew kept it entertaining. I was a bit surprised at how much of the book was just the two of them talking, and how much I actually enjoyed their banter – there were many times where I actually laughed out loud at their wit. What I really enjoy about Quinn’s novels are the believable females who actually talk back and have opinions. Poppy was everything you would hope a woman would be – smart, funny, kind, and refuses to just sit back and take whatever is thrown at her. Andrew was also a great hero, he was nice and funny and also pushed back just as much as Poppy did. This led to a very believable romance, I could see how their feelings for each other developed through the course of the book. The Bridgerton series by Julia Quinn is one of my favourite historical romance series, with Because of Miss Bridgerton and The Duke and I being my favourite two books. I highly recommend this book for those who love funny and believable historical romances.